Well, the signal it’s getting could be. 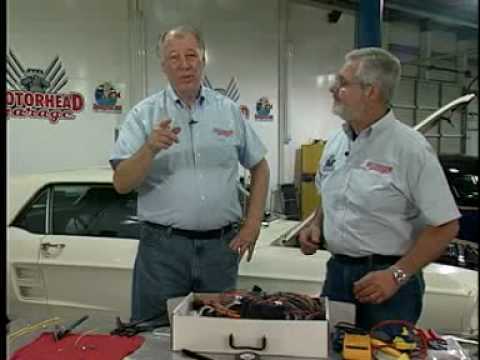 Like most other parts of a car, your wiring is there to serve a specific purpose. In the case of signals coming from a sending unit, this purpose is to transfer the information provided by the item to which it is attached. If you’re sending bad information, you’re going to get unintended results! This includes a potentially dirty tach signal. Electrical noise generated by a modern ignition system can make tach readings appear erratic. The remedy to this is to add a tach filter to “clean up” the noisy signal, and therefore smooth out the reading on the gauge. The concept has been around for years, and filters even found their way into factory GM ignition systems (see below) at new. If you switch from a factory points ignition to an aftermarket system, it’s possible you may need to add a tach filter to make the new signal usable for your gauge. Since many customers choose to modernize their ignition system along with a new wiring harness, they often assume the wiring is responsible for an erroneous or jumpy gauge reading. Requirements can vary, so it’s always best to ask your tach or ignition provider if you’ll need a filter for their system. Our wire will send the signal either way, so make sure you get the most from your upgrades!